ProLon Reviews - Is it a Scam or Legit? Developed by Professor Valter Longo, the ProLon fasting mimicking diet claims to help you quickly shed pounds and improve biomarkers for overall health. ProLon is a scientifically developed and clinically tested periodic meal plan that promises to mimic the effects of fasting, while still providing you with enough plant-based nourishment—including essential vitamins and amino acids—to remain satisfied throughout the process. And compared to water-only fasting, the company tells us that ProLon is convenient, doesn’t require ongoing lifestyle changes, and has been proven safe. If you’re tired of the dieting merry-go-round and are looking for a quick, easy solution for losing weight, all of these claims might sound wonderful. But what kinds of results can you realistically expect with ProLon, and is it worth your hard-earned money? Let’s start answering your questions by taking a deeper look at the program. 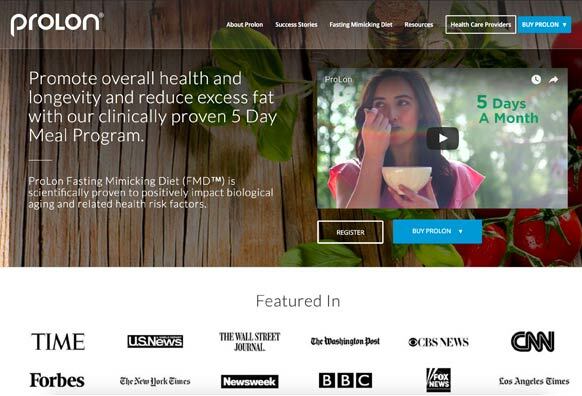 How Does ProLon’s Fasting Mimicking Diet (FMD) Work? Created in collaboration with some of the world’s best food scientists and chefs, ProLon’s meals come in five boxes (one for each day) that consist of a variety of plant-based foods like energy bars, soups, snacks, drinks, and dietary supplements that are low in carbohydrates and proteins, while containing good fatty acids. According to the program’s website, there are no additives, preservatives, or chemicals in these foods, which provide between 770 and 1,100 calories per day. The company tells us that your body won’t recognize these calories as food, thereby helping you to maintain a fasting mode, without actually fasting. Specifically, we’re told it can reduce IGF-1, glucose, and inflammation and aging markers. Depending on body weight, baseline markers, and other health measurements, low-risk or healthy individuals are recommended to undergo ProLon’s five-day fasting periods two to three times a year, while those who are considered high-risk can undergo them three to 12 times. During these periods, customers are instructed not to consume any other foods, or any additional liquids other than water. When you’re finished, you’ll have a one-day transition period, after which you can resume your normal eating habits. Have Fasting Mimicking Diets Like ProLon Been Clinically Proven? Fasting mimicking dieting was the brainchild of Valter Longo, who developed the program at the University of Southern California. Along with the university, he's also an owner of the company behind ProLon, called L-Nutra, although he’s emphasized in the past that he receives no money from the sale of these products. One completed on periodically fed yeast, which was shown to have a longer lifespan than those who were fed normally. We also encountered 67 clinical studies related to fasting mimicking diets on the National Institutes of Health’s PubMed, referencing everything from its effects on tumors and multiple sclerosis to cancer and circadian rhythm. Will ProLon Cause Potential Side Effects? In these studies, most participants reported only mild or no adverse effects on the fasting days, although none of these side effects were specified. However, the company emphasizes in several places on their website that ProLon is not for everyone and should only be used by “healthy individuals who want to optimize their health and wellbeing.” It shouldn’t be used by those under 18, women who are pregnant or nursing, those who are allergic to soy or nuts, those with a BMI less than 18, or those with diabetes or significant cardiac disease. Outside of what’s provided in each box, the company emphasizes that no additional multivitamins or supplements should be taken during the diet period. And, unless approved by a licensed physician, ProLon should never be combined with glucose lowering drugs, such as metformin or insulin. To make sure you’re a candidate, you’ll need to take a short self-assessment evaluation when purchasing (indicating age, height, weight, BMI, any prescription medications, and so forth), or reach out to your healthcare provider. The website seems to be strict about this, as it rejected a mock order during our research after only indicating that we took prescription medication. How Much Does ProLon Cost? All orders come with free standard shipping and no sales tax, except in CA. In addition to the self-assessment we discussed in the previous section, once your purchase is complete, you’ll also need to complete a guidance call with the company’s dietitian or nurse practitioner to finish processing your order. ProLon offers a 30-day refund policy on all unopened boxes, less S&H, any discounts received for purchasing multiple boxes at once, as well as a 15 percent per-box restocking fee. In order to speak to a representative or process a refund, you’ll need to contact customer support at 323-580-6855 or admin@l-nutra.com. What Are Dieters & Professionals Saying About ProLon? While there seems to be mounting clinical evidence that infrequent fasting mimicking diets could provide some measure of weight loss and other potential benefits, there is some concern that this doesn’t extend much beyond calorie restriction. Specifically, that the control group in the previously noted human study didn’t reduce their calorie intake, so it’s not quite clear whether FMD’s benefits stemmed from fasting or from calorie restriction. Despite this, blogger Quantified Bob perused the program’s studies and came up with his own FMD (not ProLon specifically) in April 2016, finding that it reduced his body fat by about two percent, while actually increasing his muscle mass. He also reported good energy and mental clarity during the process. After undergoing blood work, he found his white blood count went down, his testosterone levels increased by one point, and his stress (cortisol and adrenal) and liver levels were “optimized.” Overall, he reported being “very impressed” with his FMD results. Finally, Erin Van Der Meer tried out ProLon specifically, noting that she’d “100 percent do it again,” since it was simple and helped her face, stomach, and thighs look slimmer. However, she also noted that the gained back 25 percent of the weight she lost once she resumed normal eating. Based on the available clinical evidence (although preliminary), as well as reports from actual users, it appears that a fasting mimicking diet like ProLon could help you lose a quick few pounds, as well as boost several biological markers associated with good health. But unless you’re clearly someone with a lot of background knowledge (like blogger Bob from earlier), only you can decide whether this weight loss is worth the $250 or more price tag for each pre-filled box. As consumers ourselves, we’re focused on helping you get the most bang for your buck. Which is why we’d strongly recommend speaking with your healthcare provider about ProLon, and whether or not it might meet your expectations (and budget), prior to placing your order. The company strongly emphasizes on their website that the program should only be conducted under the supervision of a doctor anyway, so this will provide an opportune time to address more than one issue during the same visit. ProLon was easy to do for me. I knew going in this is not for weight loss. This is to put your body into autophagy in order to stimulate growth factors. The name ProLon is prolonging your life. You may lose weight, but I wouldn't say do it only for that. You should do this if you have inflammation for sure and it is ideal to do a series of three. The diet is mimicked from blue zones. Sustainable and easy to do, but no health benefits noticed. Felt lighter on day 4-5, slept well, but did not experience an increase in energy or mental sharpness. Pros: Saves you time to count calories and makes life easier for 5 days. Cons: Not sure if there are any health benefits, any other fasting or simply 5 days of veggies and gluten-free, dairy-free, sugar-free will do it. You are eating processed foods like bars and artificial powder soups, instead of having fresh and raw crunchy veggies. I just finished and it didn't really live up to my expectations. I look thinner and lost a couple of pounds, but of course, that's going to happen when you restrict calories and don't eat sugar for five days. The food was OK...bars are bars, dinner soups were decent, lunch soups eh. On days 4 and 5 ProLon says most people feel less hungry, an energy surge and increase and mental clarity...I did not experience this, and in fact felt extra hungry and tired on day 5 and could not focus on anything! On top of that, customer service told me originally that I could get a replacement for the tomato soup if I wrote it in the order notes (which I did). The box came with three tomato soup packages. I emailed customer service and they said they would overnight them. However, that was three days ago and they're still not here. I didn't get blood work or anything to measure results other than how I look and feel, and this is also being written right after completing the diet, so I don't have an opinion on any lasting effects yet. But after looking more into the allowed substitutions and calorie and nutrient breakdowns, I think you could recreate this yourself without wasting the money and have better food. One of the reasons the weight loss business doesn't advocate fasting is because they can't make more money on people eating less. It seems like ProLon has found a way to hack that "problem." Fast-mimicking boxes contain food-mimicking packets. I have real veg with olive oil instead. ProLon calorie intake is 1100 day 1 and 800 days 2-5. With that knowledge and for next to nothing, you can mimic the mimicking diet. If you enjoy feeling ravenous and dull-witted, this diet is for you. Seriously, it was a dreadful week that ended on Day 6, when I ate everything in sight and regained whatever pounds I’d lost in a few days. Basically, you pay $250 for a half dozen packages of dried soup mix, some chewy bars, and herb tea. Overall, a perfectly ludicrous waste of time and money. Not worth it for a variety of reasons! I am in my late 60's, very healthy, wanted to try this to see if it would reset my metabolism. I've fasted for 40 years, so used to it in all forms. The actual fast was easy; however, there are a few things that you should be aware of. First, it is extremely expensive, and in my opinion, definitely not worth what you get in any way, shape or form. Second, I started without any physical problems; healthy in mind and body. On day two I started getting joint aches and pains, by day four I felt like I had arthritis throughout my body, and by day five I got heart palpitations! Loads of support BEFORE and absolutely nothing afterwards from them. I'm a retired naturopath, so immediately loaded up on nutrients and some herbs. It took me three days to get back to no problems, but the experience left me very upset as I highly value my health. Be aware. Check other reviews as you will only see good ones on their site! I would recommend going on Amazon and checking out (by their reviews) some of the excellent fasting books out there instead of wasting your time, money and health on this! I've just finished my five-day ProLon Dietary plan. - Feeling lighter (lost 2 pounds). - Food tasted much better than expected. - No constipation (which I would've expected on such a low cal diet). - Fatigue during the day. - Not feeling a huge difference. - Felt dizzy during the day (not in the morning though!). If it would've been cheaper, I probably would like to try it again in three weeks to see if I would feel differently, but it's way too expensive for what it is! I did the entire 5-day ProLon diet to the letter. I lost 3 lbs. The diet is incredibly salty, which I'm guessing is needed during a fast. I will say that I did experience an energy burst on day 4 and 5, but it came at a very high price. I could not sleep at all while on the diet, the joint pain I experienced while on the diet and for days afterward was intense. I also had a horrible eczema flare up, as the diet is not derived of anti-inflammatory ingredients at all. So I as mentioned in my title, this diet might work for some, but definitely not for the masses. I would not spend money on another cycle. I'm still trying to undo the damage it created in my body. Unhealthy, not effective and expensive! This seems to be somewhat of a scam. First of all, the price of close to $300 is ridicules for five-day fast. Given the fact you get powdered soup bags for lunch and dinner as four snack bags of olives (each containing 10 olives), two fish oil pills, two vitamins, and three glyceryl liquid. Oh and then there is the high sugar high carb "L-bars" for breakfast. I am 100% for fasting. I think fasting is fantastic and can clean. Some of us may need help and there are multiple other resources out there that are more effective and affordable (or even try using the foods around your home). But this product not only is it unhealthy, after the diet it recommends high carb diets that are are known to be unhealthy. Their goal is to sell you their nicely packaged product that I am sure it is marked up 300%. I have tried many products for weight loss and this is way far beyond! They use clean ingredients and it detoxed my system in the blood level! People who are writing negative reviews because they probably didn't have health providers to guide them through! I have about 15 lbs to lose and have tried all there is to try. I followed the ProLon FMD to the letter for five days. Prior to starting ProLon, my fasting blood sugar was 80. After sticking with the 5-day meal plan, on day 6, my blood sugar was 88. Prior to starting ProLon my Blood Ketones read .9. After ProLon, my Ketones actually went down to .5. I did not lose an ounce, after 5 days of basically a high carb, calorie restricted diet. No inches lost either as I measured before and after the 5 day diet. I think this was really expensive for no results. As usual, the hype over this diet was not true. I feel like it was wasted money. I will not be recommending this to my patients. Nor will I invest this kind of time and money again. Hello. I’m really interested in your review. I’m currently ending day three of the fast and I’m gaining weight, only a tiny amount but still! I am having an impossible task trying to lose body fat, hence me using Prolon. I just wondered are you having the same trouble as me? It must be making me retain water as I’m certainly not consuming many calories in this. Write a Review for ProLon!